With 119 basilicas, Poland has the third highest number of basilicas in their country, after Italy (539) and France (168). The Polish city of Kraków has the third highest count per city as well, right after Rome and Buenos Aires. In honor of the Polish origins of the Basilica of St. Josaphat (which was highlighted earlier this week), this week’s 7 Quick Takes is 7 Polish Basilicas. Edit: I forgot that tomorrow is the first official feast day of Blessed John Paul II. So, the Polish theme is very appropriate! The Jasna Góra Monastery is the most popular place of pilgrimage in all of Poland. Why? Housed here is the icon of the Black Madonna of Częstochowa. Many miracles are attributed to veneration of this icon, with the most important being the miraculous saving of this monastery from the invasion of the Swedes during the 17th century. Legends has it that when St. Florian’s relics were brought from Rome to Kraków in 1184, the ox carts carrying the relics stopped – the relics had suddenly grown too heavy to be taken any further. St. Florian’s Church was built at this very spot. Although St. Florian was in no way associated with Poland, he eventually became the country’s patron saint. During a great fire that broke out in the city in 1528, the church was miraculously saved, which is attributed to the relics contained within. This has caused St. Florian to be seen in Poland as the patron saint of firefighters and chimney sweeps. The future Pope John Paul II once worked here as a vicar. Although I was looking for basilicas in Poland, since I suspect I will never go there, I picked St. Mary’s Basilica because of its supposed resemblance to St. Michael’s and St. John Cantius in Chicago. If you read about our trip to St. Josaphat’s, you know that we have been recommended to go to Chicago and see St. John Cantius. Also, St. Mary’s Basilica plays the Hejnał mariacki – a five note trumpet hymn – from the top of the tower every hour. The hymn is a tribute to the bugler who sounded the alarm before a 13th century invasion of Mongols, but was shot before he could complete it. When the hymn is played each hour, it is cut short as a tribute to this event. The national significance attached to this is so popular that the hymn played during the noon hour is broadcast all across Poland via radio. Niepokalanów is a religious community founded by Saint Maximilian Kolbe in 1927. It was once the largest religious community in the world, housing up to 760 men. Father Kolbe founded another community like Niepokalanów in Nagasaki, Japan in 1930. The community hosts a museum for St. Maximilian Kolbe. The Basilica of Our Lady of Licheń is the largest church in Poland and one of the largest churches in the world. The icon of Our Lady of Sorrows is also known as Our Lady of Licheń; her icon is housed in this basilica, making it a popular pilgrimage site. 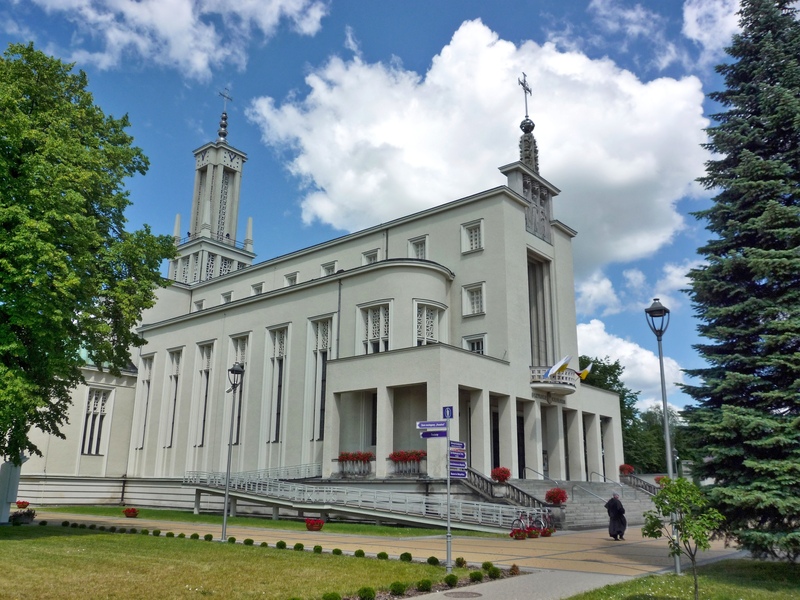 The Sanctuary of Our Lady of Ludźmierz hosts the statue of Our Lady of Ludźmierz, which draws many pilgrims each year. The church is known as being connected to what some see as a papal prophesy foreshadowing the ascent of the future Pope John Paul II to the seat of St. Peter. When the statue of Our Lady of Ludźmierz was being crowned by a cardinal, the then Father Karol Wojtyła – who was the bishop of Kraków – was in attendance. During the ceremony, the statue slipped, and Father Wojtyła caught the scepter that had slipped out of the statue’s grasp. The Cathedral Basilica of Sts. Stanisław and Vaclav is more commonly known as Wawel Cathedral for its location on Wawel Hill alongside the Royal Castle. The Cathedral is considered the national cathedral, with many important figures being interred in the crypt. This includes many of the Polish monarchs since the 14th century, as well as Saint Stanislaus and Saint Hedwig. The future Pope John Paul II celebrated his first Mass here on All Souls Day (November 2), 1946. This is only a small slice of the Polish basilicas, and so many of them have a fascinating history or legend associated them. Have a favorite? Share it in the comments! Basilica of Our Lady of Licheń looks simply amazing. I don’t know if I will ever make it to Poland, but man, that would be awesome. I think I’ve already mentioned going to the Basilica of St. Paul in St. Paul, MN, but also try to get to the Cathedral Basilica of St. Louis is covered in mosaics, it’s exquisite. Beautiful. We have friends that just left the States to be missionaries in Poland. When I visualize their destination country it never looks this grand and glorious in my head. But oh my, these churches are incredible. Wow, your photo’s are beautiful! That’s such an interesting story about the bugler at St. Mary’s. It’s amazing how much history one place can hold, isn’t it? Thank you for your kindness about the VP post! Loved this post! I’ve never made it to Poland, but with ancestors of both myself and my wife coming to America from Poland, its definitely a place we want to make a pilgriimmage to someday! This gives me some great ideas! Someday….